Polaris Family Dental offers implant dentistry to residents of Columbus, OH and the surrounding communities. Our office is experienced in dental restorations, including dental implants, to replace missing teeth. We offer different options for dental implants to meet the needs of each individual patient. A dental implant is the only permanent solution to missing teeth. Unlike previous tooth replacement methods, like dentures and bridges, dental implants can function and look like a natural tooth for your lifetime and do not affect your surrounding teeth. Strong and stable like a natural tooth, dental implants allow individuals to regain confidence and comfort following one or more dental extractions. No longer must people with missing teeth have to remove their temporary teeth, avoid certain foods, alter their speech, or deal with any of the hassles of dentures. Implant restorations are the longest-lasting and most functional way to replace missing teeth. Whether you need one tooth replaced, or multiple teeth, we have the right kind of implant restoration for you. Using a titanium root, a specialist will implant the base of the “tooth” into your natural jawbone, below your gumline. On top of your gumline, we attach a life-like crown to the titanium root. The crown looks and functions like your natural teeth. Dental implants have the highest success rate of all dental replacement methods, and we are proud to offer this effective, cutting-edge method to our patients. Dr. Winner offers Nitrous Oxide and Sedation Dentistry to make her patients comfortable during procedures. If you are missing one or more teeth, consider the permanent solution of dental implants. 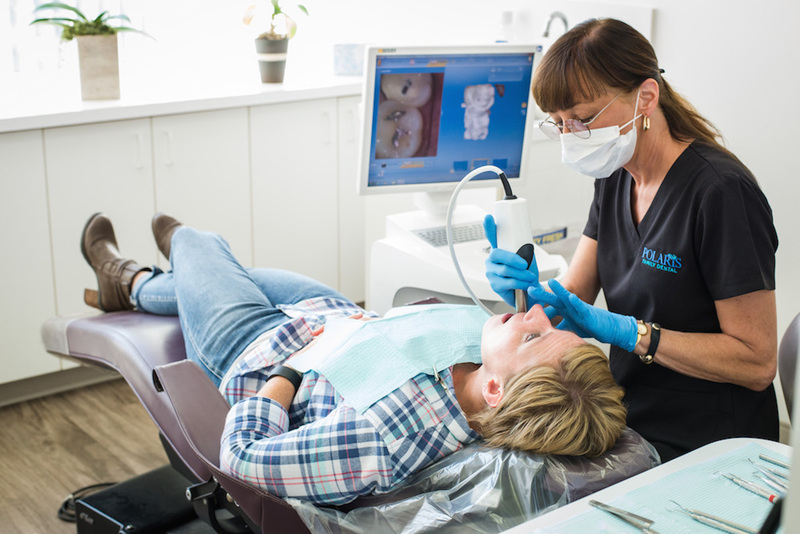 The experienced staff at Polaris Family Dental is proud to help our patients regain confidence and control of their lives through implant restoration. Contact Polaris Family Dental today to schedule your initial consultation!